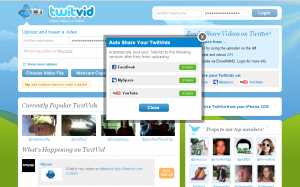 TwitVid recently updated their website/app adding the ability to upload your videos to Facebook, MySpace and YouTube. To turn the features on, you you will need to go to their website, login and choose where you would like the videos to upload. The next time you post a video to Twitter using TwitVid, it will also add the video to the other places you have chosen. You do not have the choice to post one video to just Twitter and another to both Twitter and Facebook. Once you turn on the Facebook (or YouTube or MySpace) option on the website, it will automatically upload all the videos you post on Twitter to the other places. In order to not upload a video to a certain place, you would have to go back onto the website and remove that option. – When a video is uploaded to Facebook it adds the video to your “wall” however, it does not add it to the actual Video app in Facebook. – When a video is uploaded to YouTube it is uploaded directly into your YouTube account. – When a video is uploaded to MySpce – WHAT! Who uses MySpace! !